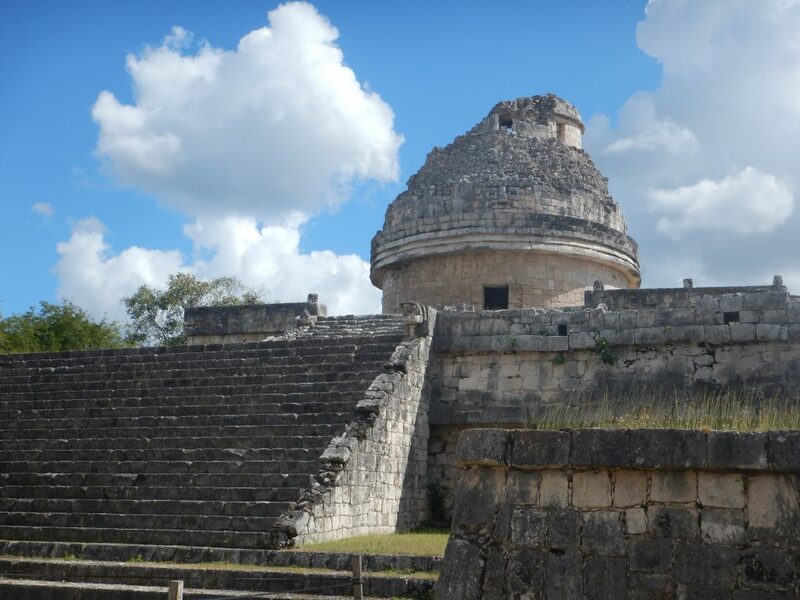 Cancun I’ve read about the great Mayan ruins in the Yucatan and Quintana Roo for decades, and Chichen Itza has always been fabled as one of the most extraordinary. 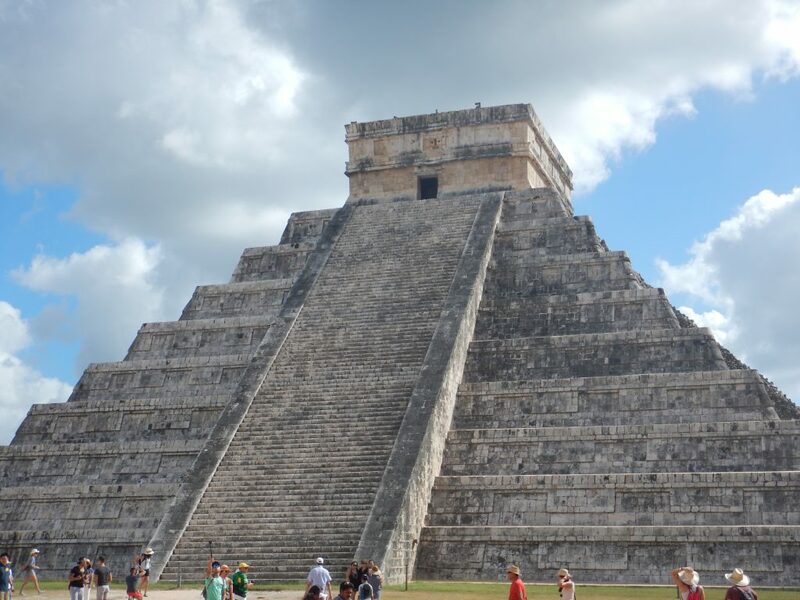 When travelers once spoke of the Seven Wonders of the World, Chichen Itza was often on the list. I still cherish my copies of John Lloyd Stephens great two-volume classic, Incidents of Travel in Yucatan illustrated by Frederick Catherwood published in 1841 after his journeys. “Raiders of the Lost Arc” always paled in comparison to their story, and the vivid illustrations that made me feel like I was there, plunging through the jungle undergrowth to see what few non-Mayans had ever seen. We had spent Christmas Day at the Uxlan ruins in one of the more amazing days in a legendary list for our family. We weren’t alone, but it didn’t matter, the power of the place was incredible. We were prepared for Chichen Itza being a different experience in some ways. The books indicated that the site gets more than a million visitors annually. We knew to be early. Chichen Itza in Mayan means something along the lines of “mouth of the well of the Itza people.” When we finished wending out way up the narrow road into the site, and parked with amazing ease for barely a buck and change, we saw a horde of people near the ticket booths and walked up to them in order to find the end of the line to get ours. It turned out that Chichen Itza now means “mouth at the well of the hawker people.” We walked through one hawker’s stand after another, until reaching the end. The falling expressions on hundreds of faces was shocking, but in a little more than a half-hour we had our tickets in hand and were ready to see the ruins and leave the hawkers behind. Leaders of ACORN’s hawkers’ union in India always asks me if there are hawkers in the United States, and I say, no not many, but they would be impressed at the way all of these tourists were being channeled through the stalls to the booths. I was too, until we passed the ticket booth and found that we were still walking a gauntlet of hawkers and booths. 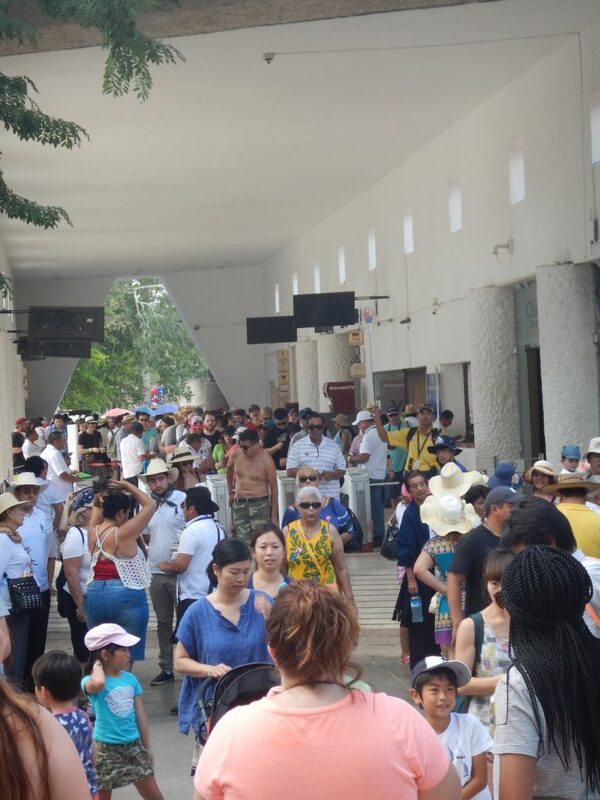 They weren’t selling hats and yelling, “Five dollars, cheaper than Walmart,” once we got into the archeological park, but they were literally everywhere we walked, often heralded by the sound of jaguar cries they were trying to sell. 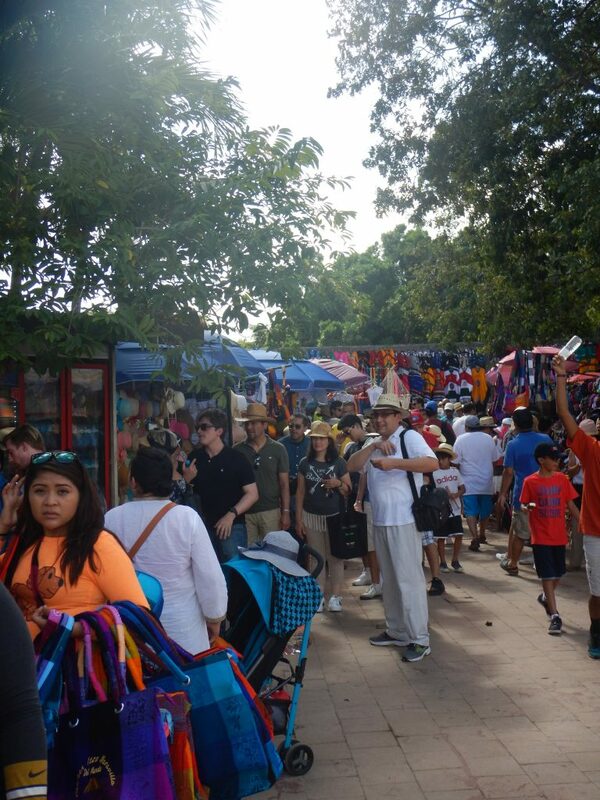 Often we could tell we were on the right path to see the Observatory or the cenote if it was lined by hawkers’ booths on both sides. Wherever there was shade away from the monuments, there were hawkers. It was impressive and amazing in its own right. Google Chichen Itza and hawkers, and one Trip Advisor report after another from Australia, the United Kingdom, New Zealand says almost the same thing: Chichen Itza is Awesome, but What’s with the Hawkers! If this is supposed to be a community benefit to the local population, it fails there mainly because so few are making any sales. We walked three miles according to my son’s counter. Who would want to lug souvenirs through 90 degree heat? My daughter looked at fans she had priced in Centro Merida and they were 200 pesos or $10 dollars more expensive at Chichen Itza. How does this help the local community? What is the government thinking? As at Uxmal, the federal and state government both separately collect money for tickets and stamp the tickets as you enter. Is there no coordination or is this an issue of there being no trust between the state and federal government? The government is probably right to believe that people like me and my family would weather any storm to see Chichen Itza in all its majesty, but why not leave millions in wonder and awe, rather with a funny, nagging taste in their mouths after the experience. New Orleans In organizing you never know what might work, and every once in a while we get the opportunity to try something new, and it’s exciting to hold our breath to see what might happen next. 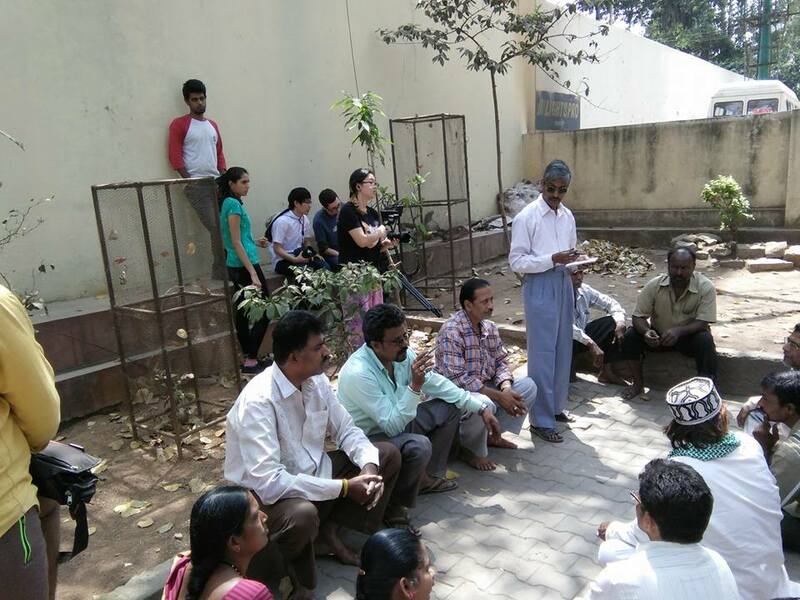 This minute the back story is the whole story, but soon a special video recruitment tool will be debuting throughout Bengaluru and the south Indian state of Karnataka for ACORN’s hawkers and street vendors union, and we can hardly wait to see whether it will work. Certainly we’re not alone in trying to catch lightning in a bottle. A Washington Post article forwarded to me by a colleague was an “oh, wow!” piece about Indian university students who were arrested for giving seditious speeches that have gained new life and a huge audience once repurposed as “foot-tapping musical numbers” that have become “a surprise online hit with the Indian youth.” On a small scale we want to see if we can create a recruitment vehicle for ACORN with enough pizzazz that hawkers will pass it back and forth in the same way, and flock to the union. Our normal recruitment method is going market by market, stall by stall, and organizing meetings for workers sitting on pieces of tarps on dusty roadways to talk about organizing when there is a lull in business. But, what the heck, let’s try this, too. The idea developed after several large doses of serendipity. I stumbled onto a brilliant book called Geek Heresy: Rescuing Social Change from the Cult of Technology by Kentaro Tomayo that I encouraged everyone everywhere to read. I tracked down Tomayo, currently a professor in Michigan, and interviewed him on Wade’s World (www.kabf.org) which went spectacularly. We both agreed we should continue the conversation and did so the following Monday before the podcast was even up on the KABF website. As we talked about his work and ours, there was an intersection in the time we had both spent in Bengaluru, where he had helped set up a Microsoft lab and we had organized communities and lower waged workers for years. He asked if I was familiar with the Indian phenomenon of sharing videos from mobile phone to mobile phone with or without internet and smartphone capability. Of course I was clueless, but I knew change was coming because our Bengaluru organizer, Suresh Kadashan, finally had a smartphone during my visit with him last year. When Kentaro asked if we would be interested in trying to see if we could create a video recruitment tool to see what impact it might have on enrolling new members for our hawkers’ union, he had me from hello. One thing led to another and with Kentaro we linked up with another professor, Jay Chen, at NYU’s outpost in Abu Dhabi on skype, and he recruited a student, Koh Terai, with film experience who was game to make it happen, who also recruited another student to help who had ties to India, and then with Suresh’s help the pieces were falling together. Skype calls between New Orleans, Michigan, Abu Dhabi, Berlin where Koh was studying temporarily, and Bengaluru were – to my mind – a technical miracle as well! Through four drafts of a script by Koh and three days on the ground in the markets of Bengaluru with Suresh which included recruiting some of our members to dance, Bollywood style, in the video, the rough cuts were made and the “stills” alone made me ready to join yesterday. It’ll be another couple of weeks until we have the video ready for prime time in the markets of Bengaluru, but 21st century organizing, thanks to our new friends, Kentaro, Jay, and Koh, here we come! Dub Sharma – Azadi [Audio] | Featuring Kanhaiya and Friends– One of the remixes of the student’s speech to music. Visit ACORN International for more video stills of our hawkers film.